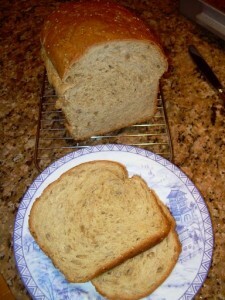 This month’s Bread Baking Day (BBD) theme is multigrain bread, picked by Rachel of Tangerine’s Kitchen. BBD is the creation of Zorra (1x umrühren bitte), and a brilliant idea it was! It had been a while since I participated in BBD, and I really wanted to get back into it. My life has been so busy, that when I sat down a few weeks ago and tried to figure out when I had last baked bread, I was horrified to realize that it had been about four months. FOUR MONTHS! I had to remedy this, and soon. So I started baking bread again, and discovered that I had missed it a lot. I think of all the baking I do, bread baking is my favorite, and life is too short not to do something you love, particularly when it makes everyone happy. For inspiration, I turned to the wonderful King Arthur Flour Whole Grain Baking: Delicious Recipes Using Nutritious Whole Grains . I had a lot of options, and one of the great things about baking bread is that you can end up with a large assortment of flour. I think I have about 18 20 different flours on hand, but I am a lightweight in that department: Mary has about 27. Thanks to Mary and the Bread Baking Babes, I have added teff flour to my inventory, but that’s another story. So, pretty much whatever I chose to make, I would have an opportunity to use up what I had on hand, the theme of Frugal Fridays. As I was perusing the pages of the cookbook, Master Chow informed me that we were out of bread, and by golly, he wanted a turkey sandwich that day. I quickly settled on Toasted Sesame and Sunflower Loaf. 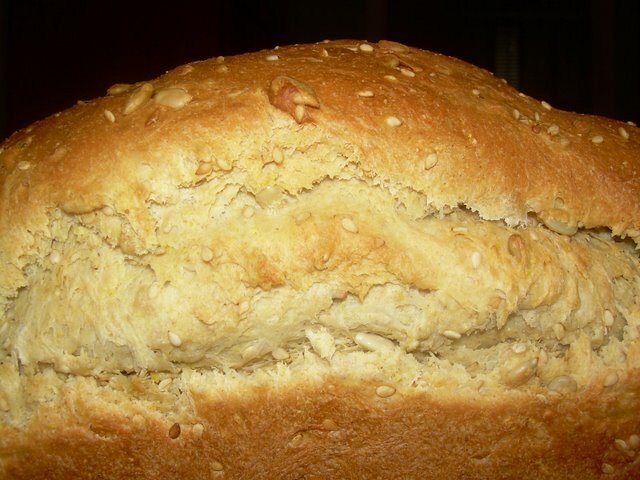 The bread contains wheat and rye flours, as well as cornmeal, and oats (I forgot to add the oats.) It also calls for sunflower and sesame seeds, which we love. Bingo! I had my bread! I tweaked things a bit, using atta flour, leaving the seeds raw, and changing some of the oils, but that’s about it. This bread was remarkably easy to make, and yielded a sturdy but tender loaf that is great toasted, and works well in sandwiches. When I say easy, I mean easy – you throw everything in a bowl, mix it together, and a couple short rises later – voilá! Bread! That apparently goes really well with turkey! I, myself, made a soy bacon-lettuce-and-tomato sandwich with it, and it was exceedingly good. And this week, Nancy of The Dogs Eat the Crumbs joins me with a tasty looking entry: Smashed Fingerling Potatoes with Peas and Onions. Nancy and her freezers were having issues, space issues that is, so she’s taking the bull by the horns and using up what she has on hand. I’m also sending this along to Susan’s blog for her weekly roundup of yeasty things, Yeastspotting. If you want to join me for Frugal Fridays, here is the info that you need. Recipe after the jump. If you like, toast the sesame and sunflower seeds in a dry pan until they are a light golden brown. Do NOT walk away while you’re doing this – the seeds can burn in an instant and fill your kitchen with smoke. Set aside. Combine all the ingredients in the bowl of a stand mixer (or in a large bowl if you’re mixing by hand), and knead until you have a soft smooth dough that passes the windowpane test. Now, you’re windowpane may not be great because of all the seeds in the dough, but you should be able to produce one after kneading for 8-10 minutes in a stand mixer, 12- 15 minutes by hand. Place in a lightly oiled bowl and cover loosely with plastic wrap, and let it rise until doubled, about 1-2 hours, but this will really vary based on the heat in your kitchen. Lightly grease a 9 x 5-inch loaf pan. Gently deflate the dough and shape into a 9-inch log. Place log in the pan, cover loosely with plastic wrap, and let rise until loaf crowns about 1-inch over the rim of the pan. This will take 1 to 2 hours, depending on the heat in your kitchen, but the key factor here is NOT time, but how high the bread has risen. If yours rises in 45 minutes, get it in the oven. When the bread looks about half risen, preheat your oven to 375 F. Place the pan on the center rack and reduce oven temperature to 350 F. After 15 minutes, cover loaf loosely with a piece of foil to prevent over-browning. The bread will be down when it’s golden brown and a thermometer inserted in the center registers 190 F. Cool the bread for about an hour before slicing. Flours I used: From King Arthur Flour – Organic Cornmeal, 100% Organic AP Flour, Medium Rye Flour. The atta flour was Golden Temple brand. This bread looks amazing! I would love a sandwich for lunch with it! I had my eye on this very same loaf! Looks great. I love sunflower seeds in bread. Wow, lovely slice! I need to bake some more from that book. Sunflowers seeds and grains make that a wholesome bread. Thanks for sending this in. I just bought this book. I’ll have to bookmark this recipe. Your loaf looks delicious. Great loaf! I loved this BBD theme – multigrains rule, and I love the sunflower seed addition! Ciao ! This bread is fantastic !!! May you never go another 4 months without a bread bake. What a beautiful sandwich loaf! That looks great! 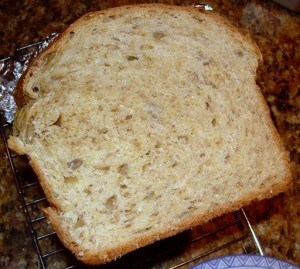 I love sunflower seeds in bread. Your bread looks fantastic! That’s a delicious combination of grains, and the seeds seen in the slice look great.